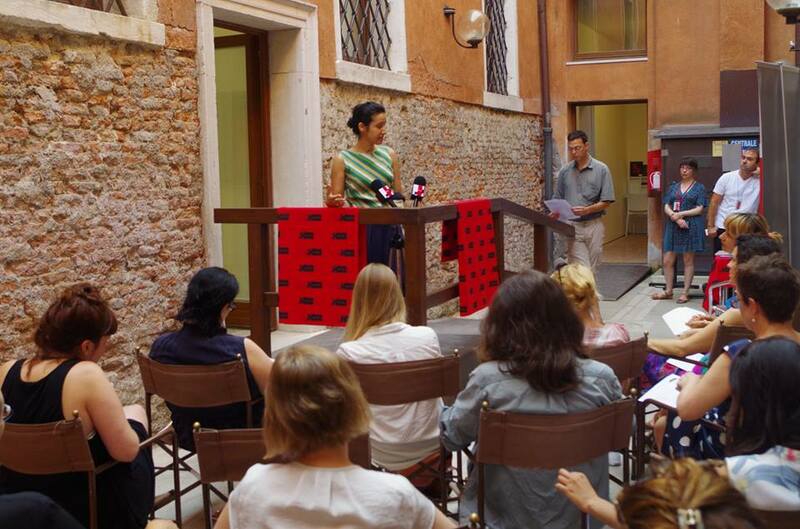 PRESS ROOM returned to Venice as a Special Project during the 7th Creative Time Summit, presenting three breakfast briefings on the mornings of 11, 12 and 13 August 2015 at the Cymru yn Fenis / Wales in Venice collateral exhibition venue. The Summit is the New York-based nonprofit Creative Time’s annual platform for the intersections of art and politics. This year it was staged as part of Okwui Enwezor’s curated exhibition for the 56th Venice Biennale, All The World’s Futures. In keeping with the Summit’s theme of “The Curriculum”, PRESS ROOM invited a number of Guest Editors to present conceptual briefings for artists and citizen journalists to respond to throughout the three days. PRESS ROOM at Creative Time Summit mirrored the structures and processes of journalism and PR, replacing the journalist with the interventionist – contemporary artists who take on the role of artist-investigator – in order to question and explore how knowledge is constructed and cemented within universal narratives. The breakfast sessions acted as an official pre-summit meeting point where the Venice arts community, summit delegates and members of the public gathered for morning coffee, croissants and dialogue. The project was supported by A plus A Gallery and School for Curatorial Studies Venice and kindly hosted by Cymru yn Fenis / Wales in Venice. Helen Sear’s collateral exhibition …the rest is smoke opened early each day for delegates attending the three breakfast briefings. Cymru yn Fenis / Wales in Venice is commissioned and managed by the Arts Council of Wales and Wales Arts International with support and collaboration from the Welsh Government and British Council. Follow on Twitter @pressroomvenice #pressroom, on Facebook.